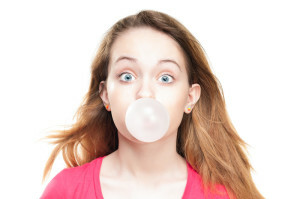 Chewing gum and gas: blowing bubbles you don't want. Blowing bubbles you don’t want! Is chewing gum giving you gas? Many people ask whether chewing gum causes gas. Some people wonder if chewing gum can lead to other IBS symptoms like diarrhea. Here’s where you can find out. Chewing gum and gas, is there a connection? Everyone that chews gum swallows little bits of air. As the air builds up in the stomach, the person chewing the gum usually belches/burps it up. BUT, not all of it comes up… And it’s gotta go somewhere ;). So the small amounts of air move through the bowels and build up. Eventually it comes out the tailpipe (so to speak). But there are some important things than can happen on the way. Can chewing gum and gas cause other IBS symptoms? Pick your “poison”? Can chewing gum be causing your diarrhea and/or gas? Here’s what I’ve pieced together so far. People with IBS don’t move gas properly through their bowels leading to trapped gas. Trapped gas can lead to spasms in the colon. 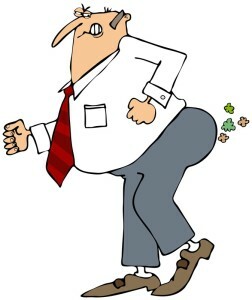 Spasms in the colon either trap stool, which can cause constipation, or rush things along, causing diarrhea. Trapped gas can also give you agonizing abdominal pain and cramps (some of the worst pain of my life). Now some people believe that the sugar in the gum is the problem and not swallowing air. I think the amount of sugar in gum is probably easy for most people to digest and absorb before it reaches the colon. That’s not true of the sweetener used in sugarless gum though. Does chewing sugarless gum cause gas? There is a lot of evidence out there that chewing gum can cause gas, and that sorbitol in sugarless gum can cause gas and diarrhea. Yes. Since the problem is swallowed air, chewing sugarless gum causes gas just like chewing regular gum. But sugarless gum has an extra trick up it’s sleeve. Sugarless gum uses an artificial sweetener, usually sorbitol, and THAT can cause gas too! The undigested sorbitol travels down into the bowel where it’s broken down by bacteria. The bacteria eat the sorbitol (Sorbitol is a sugar alcohol) and pass their own gas. This can leave you feeling bloated and full, or make you gassy. Sorbitol can also give you diarrhea. Does the Sorbitol in sugarless gum cause diarrhea? Sorbitol is actually used as a laxative. That’s right, Sorbitol is used by doctors to loosen up stool. If you already have loose stool (diarrhea) and cramping, I’m thinking Sorbitol, sugarless chewing gum and gas are the last thing you need! What other ways can chewing gum cause gas? When most people think about some delicious food, it makes their mouth “water.” That water is saliva, and it’s a sign that your digestive tract is gearing up to eat food. If you chew gum, I believe it gets your digestive system moving including your intestinal tract, aka bowels. That can lead to problems for those of us with IBS, due to trapped gas, bloating and abdominal spasms. So why chew gum at all? I admit I sometimes chew gum to help settle my stomach after a big meal. It’s something my mother told me about, and it seems to help my reflux. But I usually only chew the sugared kind (no Sorbitol for me), and I don’t overdo it. Chewing gum and gas… One leads to the other. Of course what you do is up to you :). Find out about other foods to avoid with IBS, or see if you have a food intolerance. I love chewing gum. It helps me curb my appetite. It does give me bad gas. I take gas pills to deal with the gas. I am trying to stop chewing so much. This article is so uninformed. Swallowed air has nothing to do with it. It’s the sugar alcohols like Xylitol and sorbitol. Giogle more, write more carefully. I went to a party last Saturday and my friend gave me a stick of gum. I chewed it for about 2 hours until I swallowed it right before I went to bed because I didn’t want to get yp and throw it away. Ever since then I have been having extreme stomache pain and been gaseous lately. I also had been constipated for 2 days now and I can no longer sleep past 3 hours when I usually sleep 12 hours. Could one stick of gum be the cause of this? I suppose it would depend on whether you’ve already passed the gum out of your system. If it already went down the toilet, I don’t see how it could be doing this. Just my opinion though. What else did you consume at the party? There may be another culprit. When I was in middle school (I am 23 now) I would religiously ask my mom for a piece of gum before leaving for school. I didn’t know it at the time but it was the cause of my irritable bowel syndrome. I literally knew where every bathroom was because it was completely unpredictable as to when I would have to go. During puberty and teenage years your are so self conscious about things like that. I was so worried about bad breath but if I had known what took me years to find out I could have avoided all of that trauma of thinking something was wrong with me. I often times didn’t eat all day if I knew I was having a sleepover or going on a date because then I’d be safe from the embarrassment of having to go in someone’s home or having to leave someone three times to go in one hour, I know people must have thought I was bulimic. I hope someone else can be saved from chewing gum, especially artificial flavored/sweetened kinds. Aspartame sorbitol and high fructose corn syrup are all laxatives and many people think that consuming a large quantity of them will cause health problems such as cancer . LOL! Glad you enjoyed it Ashlee. I’ll see if I can fix it up :). Wow, for the past few months I have been dealing with painful IBS symptoms and couldn’t quite figure out what was causing it. It was hit or miss with certain foods. One day I could be fine with a certain food, the next, severe pain and cramping. Now, after reading this, I think I have found what could be causing my symptoms! I constantly chew gum. I think it’s more of a nervous habit than anything else but I can never be anywhere without it. It also helps tame my occasional nausea. I go through way more gum than I should in a week though. I guess I’ll try cutting back and stop completely and see if it helps! I’ve never been a gum chewer but the research indicates in can be a problem. I hope your solution is that easy!!!!! Good luck Aubrey. 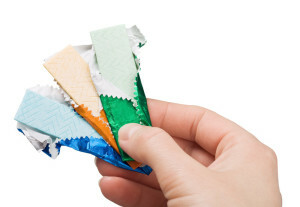 Chewing gum can CAUSE IBS, not just cause symptoms. I also know that its not caused by just trapped air either. I wish I could tell the world my story if it will help others know the damage I did to my body. In 1997 I developed a strange habit of chewing and swallowing a pack of gum every day. I started chewing an entire pack on my first plane trip to Arizona and it developed into a habit. For 3 years I chewed several packs a week, sometimes swallowing the gum. I began having abdomen pain and started seeing a gynocologist because I thougt it was womanly problems. They gave me pain medicine. After 4 years, the pain got much worse, always starting in my back. I was still chewing gum during this time. During my second pregnancy the symptoms began to get unbearable, feeling like someone was grinding their fist in my back through my abdomen. When I moved to Germany I saw an Army doctor and she never even examined me. She simply sat at her desk and listened to me, handed me a pamphlet about IBS and all the lights came on. The first thing I read was how sorbitol found in gum could trigger symptoms of IBS. MY LIFE CHANGED instantly. She did not try to medicate me but listened to me and taught me preventive measures. Now I can’t have so many things, gum is number one, caffeine from coffee or drink any soda, no fried foods, and oils. I can drink one cup of regualar tea but not two. I just wish other people knew about the ingredients in gum. I know my case is a little extreme, I mean, who chews and swallows a pack of gum a day besides me? I’m not complaining because now I HAVE to make healthier food choices but I spent more than 7 years in pain before I realized I was causing my own pain by continuing chewing the product that was keeping me in agony. Thanks so much for taking the time to tell your story Kimberly. It will help everyone who comes here with your problem.